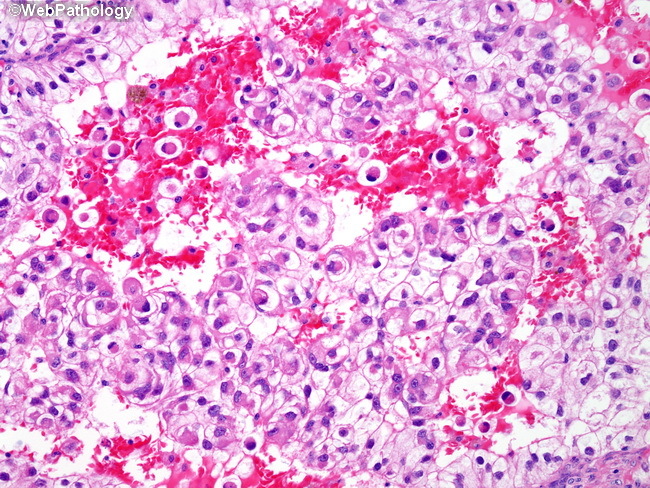 A medium power view demonstrating Fuhrman grade 3 nuclei with conspicuous nucleoli admixed with Fuhrman grade 2 nuclei lacking nucleoli. The majority of tumors are nuclear grade two or three. Accurate Fuhrman grading, universally accepted as an independent prognostic factor in clear cell renal cell carcinoma, is critical for prognostication. Nuclear grading in papillary renal cell carcinoma is recommended but not universally accepted as having prognostic value.